Benefits - Naming rights for all materials. Acknowledgement as Title Sponsor on SCANPH Website through 2014. Premium full page ad in the Souvenir Program*. Ten event tickets. Name and logo featured on event signage. Recognition during the evening awards ceremony. Benefits - Acknowledgement as Diamond Sponsor on SCANPH website through 2014. Recognition as event Diamond Sponsor. Preferred full page ad in Souvenir Program*. Name and logo featured on event signage. Recognition during the evening awards ceremony. Five event tickets. Benefits - Acknowledgement as one of the sponsors on SCANPH website through 2014. Recognition as event Platinum Sponsor. Full page ad in Souvenir Program*. Name and logo featured on event signage. Recognition during the evening awards ceremony. Four event tickets. Benefits - Recognition as one of the Gold Sponsors. Half-page ad in Souvenir Program*. Name and logo featured on event signage. Recognition during the evening awards ceremony. Three event tickets. Benefits - Recognition as one of the Silver Sponsors. Quarter-page ad in Souvenir Program*. Name and logo featured on event signage. Recognition during the evening awards ceremony. One event ticket. 10 tickets and a quarter-page ad in the Souvenir Program. Listing in Souvenir Program*. Please note: The deadline for ads has passed - we no longer can accept ads for the program booklet. May 2, 2014 Update: Thank you for visiting our online registration system for our May 7 event. At this time, online registration is now closed. We cannot accept any additional online registrations. Please note, starting today due to us having to provide the restaurant with our head count for food, there will no refunds for cancellations. A very limited number of walk in registrations may be available. To check on the status of any available walk in registrations, please call us at 213.480.1249 or email bmelchor@scanph.org. Please join with the Southern California Association of Non Profit Housing (SCANPH) as we look forward to the new challenges and opportunities in our industry and celebrating our 2014 Bright Lights! 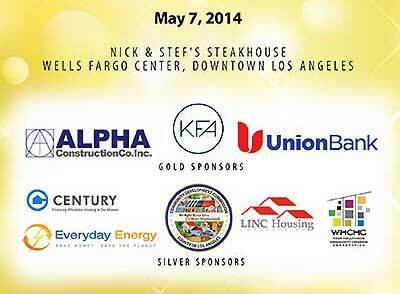 We invite you to join with SCANPH and our members, staff, and 2014 Bright Lights nominees. Thanks for participating and we look forward to seeing you! Please note: The ad booklet deadline has passed. We are no longer accepting ads for the program booklet.